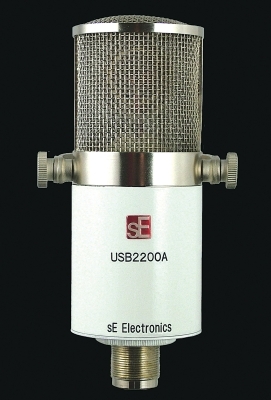 Based on the studio standard sE2200a, the USB2200a records via USB directly to your DAW and has several features unique from competitor USB mics including, zero latency headphone monitoring, mix control playback/record path, 10dB pad, bass cut and simultaneous analogue/USB feeds. The USB2200a also has a proprietary chip and software set which deals with capsule noise when transforming the 5v power supplied via the USB cable to power the capsule, by first removing noise and spikes from the current. This noise would normally be amplified, which is why other USB mics are too noisy to use in a professional environment. No other USB mic on the market offers this kind of specification, and it makes a huge difference to the performance for studio use. The chip also delivers true plug in and play capability, automatically configuring the mic to the host as it is connected.